Illustrates the British takeover of New York City following Battles of Long Island and Harlem Heights. Plan of New York Island and part of Long Island Shewing the Position of the American & British Armies before, at, and after the Engagement on the Heights August 27th 1776. This is a rare map of New York City during the American Revolutionary War issued for John Marshall's 1832 edition of the Life of Washington. The map covers the strategically important Manhattan Island and vicinity, including Staten Island, Brooklyn, Queens, and the Bronx. Various rivers, roads, and topographical elements are noted. Color coding indicates the positions of the British (Red) and Continental (Blue) forces as each attempted to maintain control of the region. 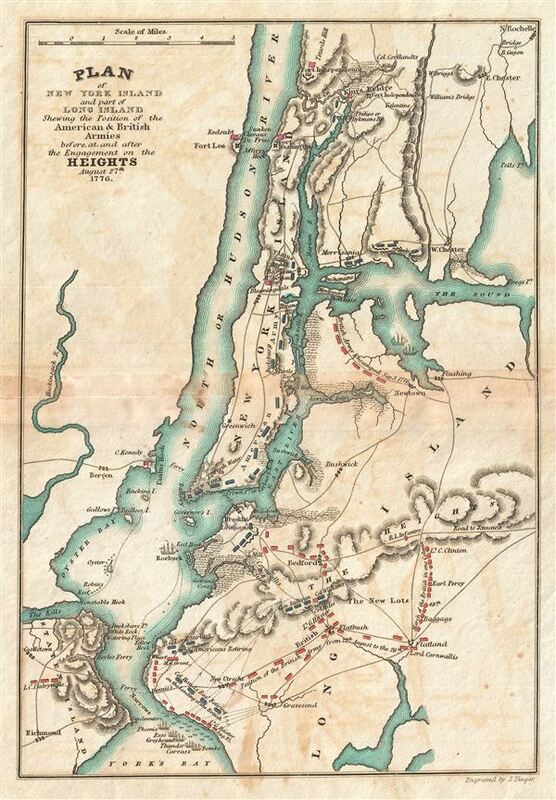 Marshall prepared this map to illustrate the events leading to the British takeover of New York City and vicinity. Specifically, it details the Battle of Harlem Heights and the Battle of Long Island. In 1776 the British General William Howe, fleeing Boston, regrouped and landed his forces on Long Island and Staten Island. After defeating George Washington at the Battle of Long Island, Howe sized control of New York City and most of Manhattan. A series of subsequent skirmishes culminated in the Battle of Harlem Heights, in what is now Morningside Heights, New York City. Washington controlled the highlands and galvanized his troops to a strong defense, holding the heights against superior British numbers and firepower. Nonetheless, the position proved untenable and Washington and his forces retreated northward to Westchester County. Howe, keen to size the advantage, landed troops in Westchester, a flanking maneuver intending to encircle Washington's forces. Washington, alerted to the tactic entrenched himself in White Plains, but was unable to hold against Howe's. Howe proceeded to drive Washington across New Jersey into Pennsylvania where he famously crossed the Delaware on December 26th to surprise a Brigade of Hessian mercenaries in the Battle of Trenton – a strategic Continental victory and major turning point in the war. Rumsey 2559.002 (1807 edition). Howes, W., U.S.iana (1650-1950): A Selective Bibliography in which are Described 11,620 Uncommon and Siginficant Books Relating to the Continental Portion of the United States, M317.